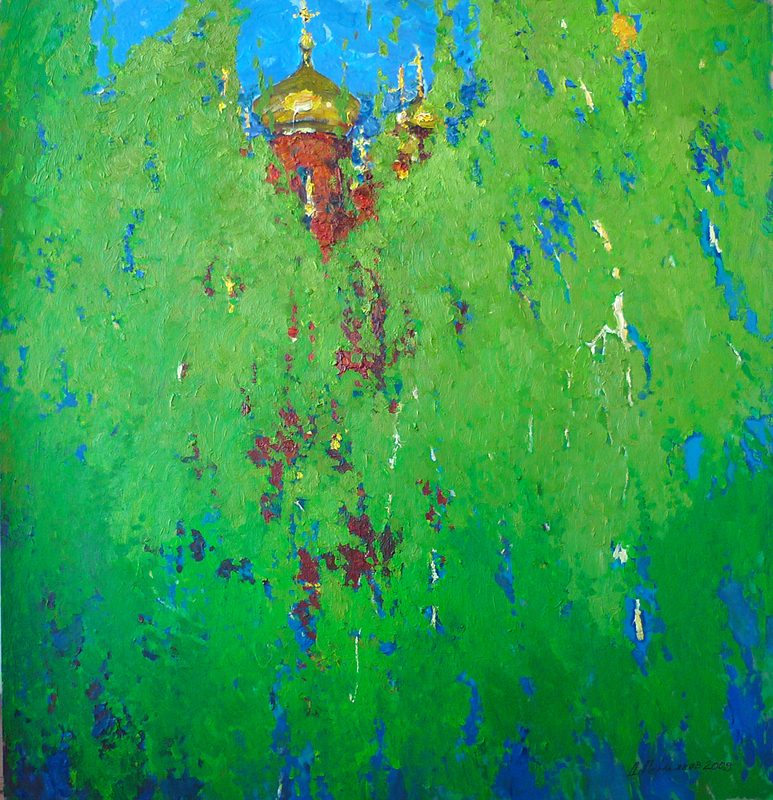 In the spring Art Show ’13 of the Russian Art & Paris journal, we present to our readers four contemporary artists. 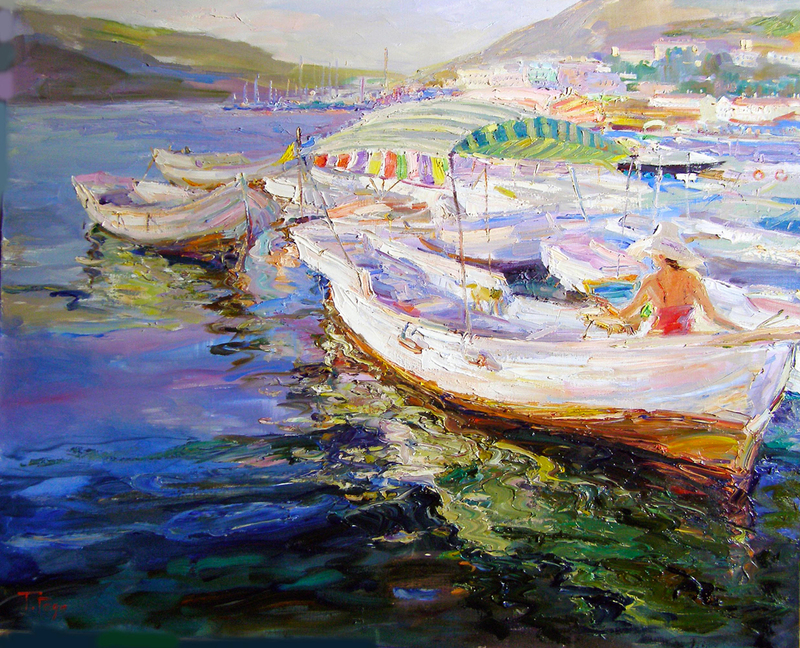 Tatiana Godovalnikova, a master of seascape from Sevastopol. A master of landscape Igor Grishchenko, Associate Professor of the painting of the Nizhny Tagil City Pedagogical Academy. 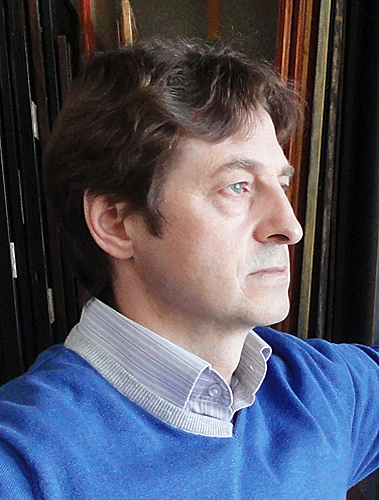 Artist Mikhail Kaban-Petrov, is a well-known for the innovative character of the artistic quests. 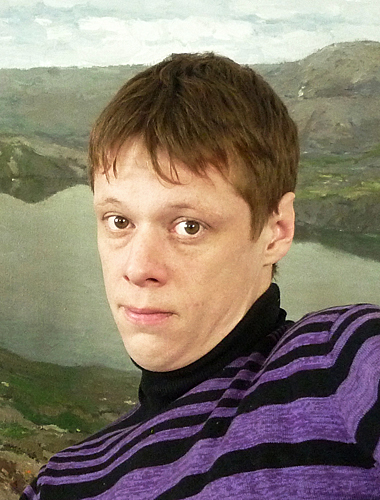 Dmitriy Permiakov, a young and very talented artist from Perm. What unites these quite different artists is the originality of artistic thought and the bright distinctiveness of their pictorial language. For the attention of all who are interested in the world of contemporary visual art. Impressionism, appearing more than a hundred years ago is a phenomenon both well-studied and rather mysterious. Very different artists have been labeled as impressionists. Different in style, in spirit, and, most importantly, in the the complex of their solvable tasks. 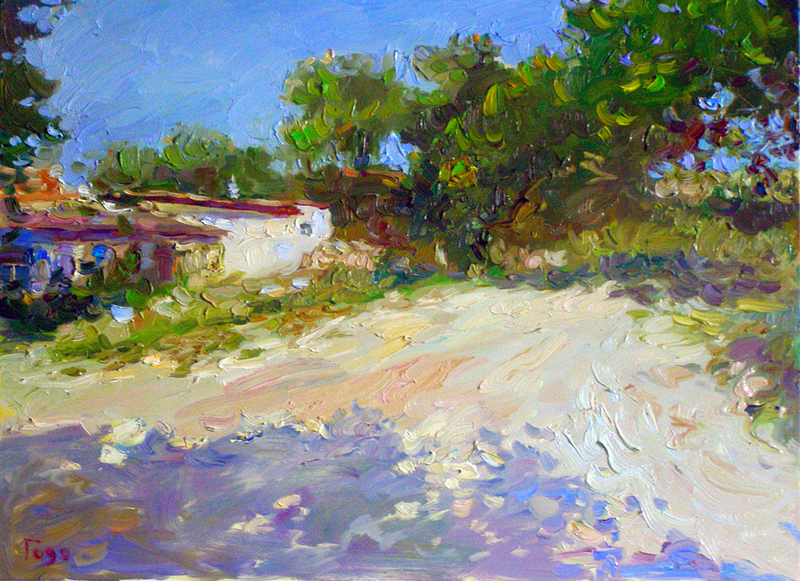 In considering the work of the artist Tatiana Godovalnikova, it is very hard to resist from using the word “Impressionism”. The question is, what does this term give us in understanding the creative artwork of a single artist? Frankly, very little, almost nothing. Perhaps more interesting is the question, what is the major focus of the attention of this artist? Immediately, to the vague term Impressionism, we add a much more specific term – light, the flow of light. 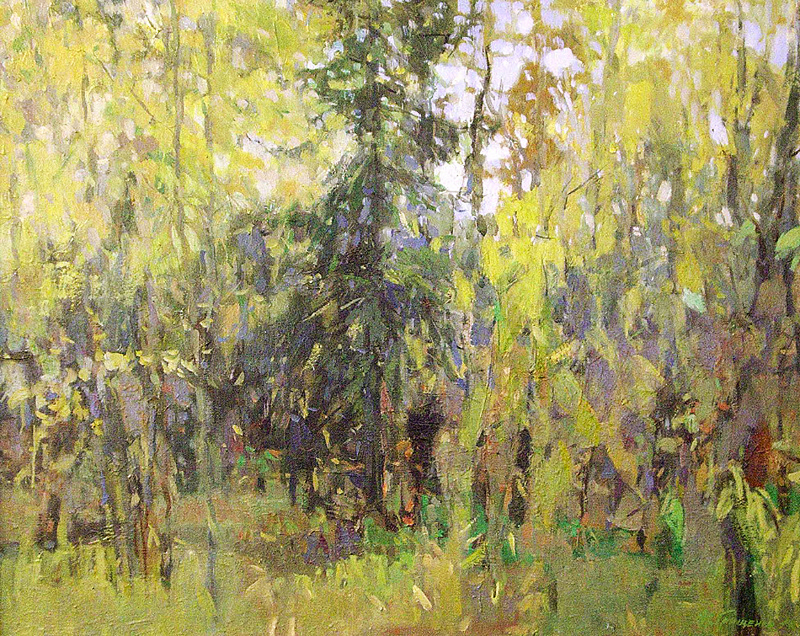 The natural light stream is what makes up the compositional, and often the plot foundation of works by this artist. Light, whose plot function was noticed even by Vermeer, acts as a structure-forming element of the image in the works of T.Godovalnikova. The precise characteristics of the light stream, become a necessary condition for the creation of an authentic visual space. 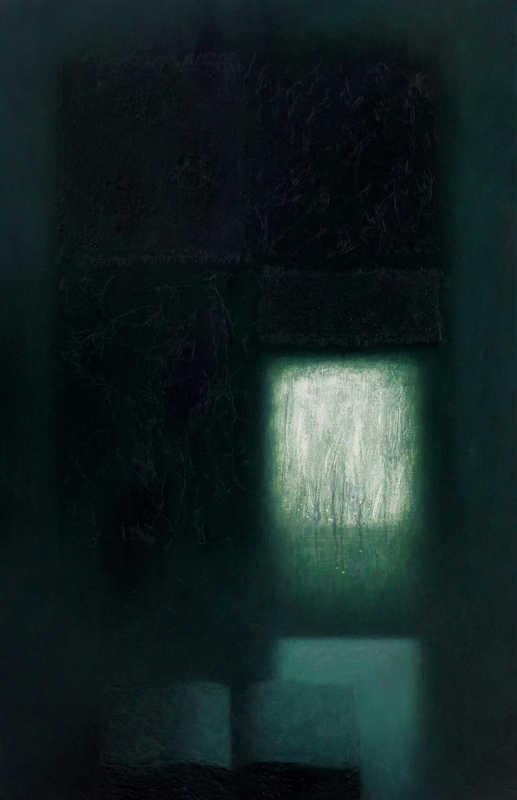 The magical aura of the artwork by T. Godovalnikova, the charm of the atmosphere of her works, are a natural consequence of the authenticity of the key compositional link – light. • Working with light, is one of the most interesting problems in visual arts. The theoretical principles of the luminosity of artworks have been developed long ago, but the practical implementation of these principles require from the artist a very serious level of mastery. Tatiana Godovalnikova demonstrates fluency in the full range of light “palette”. 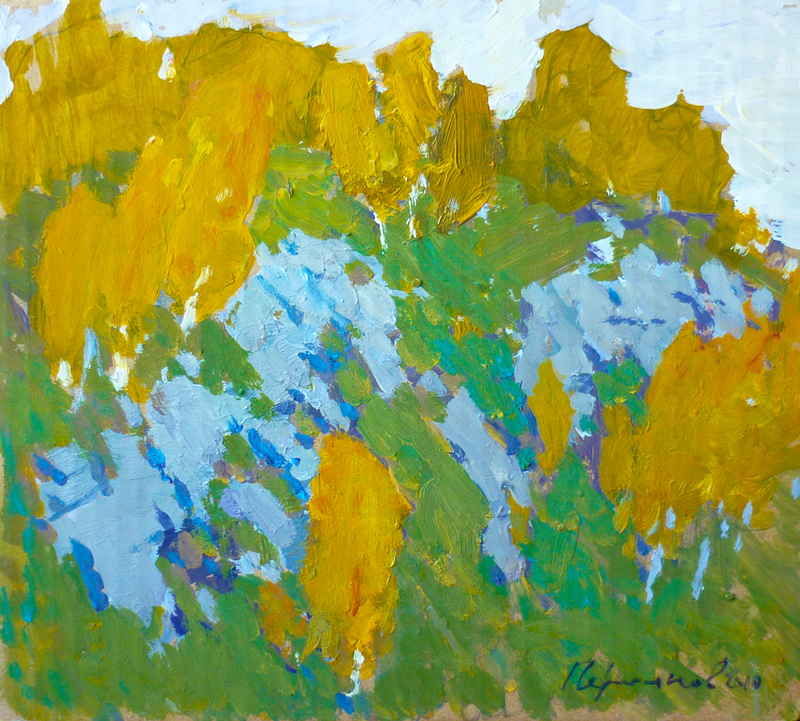 The direct sunlight, creating a powerful major emphasis, is excellent in the landscape “Heat.” The subtle sound of pouring streams of light is in the painting “Wisteria”. The soft glow of a fading day is in the transparent evening landscape “Twilight.” The luminosity of these works, the accuracy and certainty of their tonal design is striking. 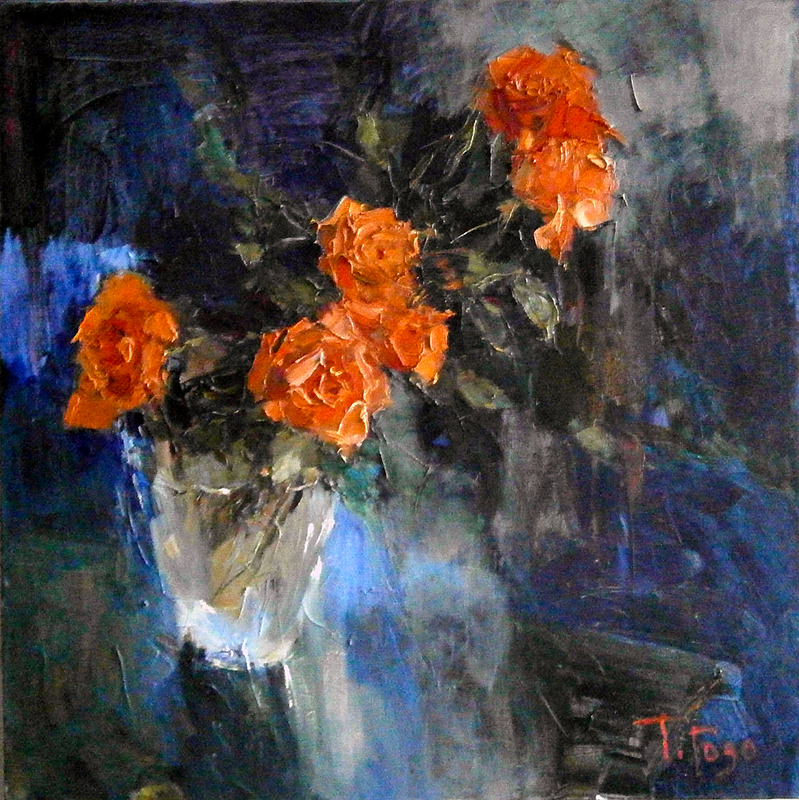 In the still life painting “Roses on blue”, the light glare becomes the protagonist of the composition, building the theme and the plot of the work through its own arrival. • In the world of painting, the night landscape, and especially a landscape with water, is one of the most difficult scenes. Not every museum collection can boast of a successful night composition. The reasons are quite obvious – the technical complexity of working with nature on night scenes, and at the same time, the complexity of working in a studio with no credible and successful natural etudes. 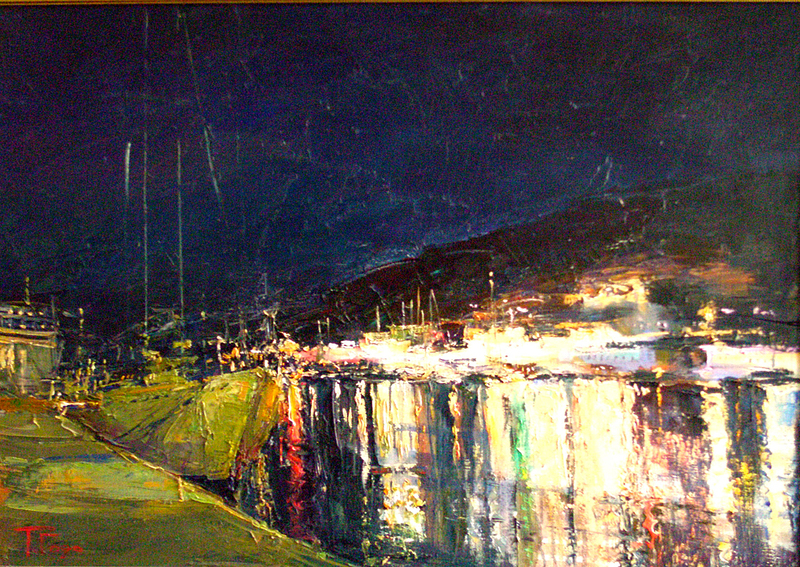 The landscape “Lights of Balaclava” can be safely attributed to the works of museum-grade. The fascinating atmosphere of a brightly lit coastal town at night; the relaxed composition of the painting, executed in a free style of painting – all speak about the work of a master. Accidental luck in works of such complexity simply does not happen. The depiction of wildlife, is habitually identified by the viewer with the word landscape. The artwork by artist Igor Grishchenko with its formal features, is very easy to attribute to this genre. With one small caveat – before us is not necessarily a landscape, but a feeling of a landscape, a recording of the artist’s emotions that arose from observing nature. Whether such an image can be called a landscape is a theoretical question. For the viewer, what’s more important is how interesting and significant is the image created on the canvas. 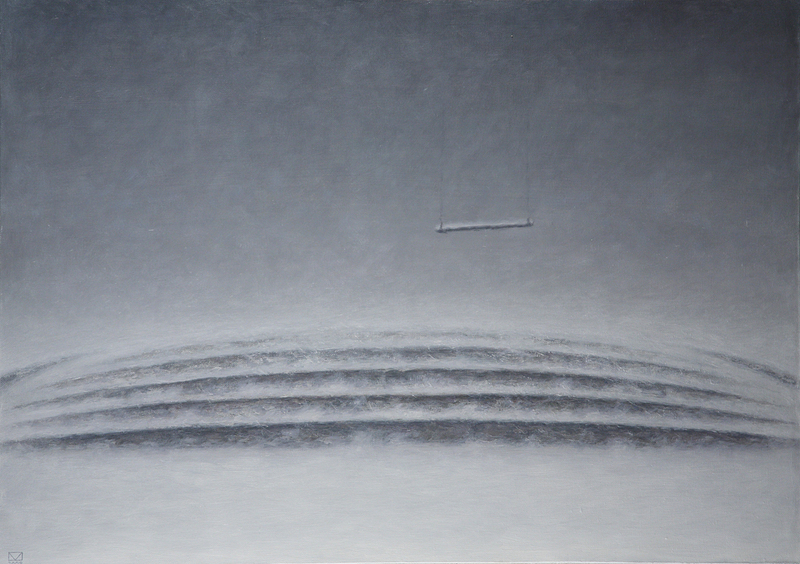 Let’s start with the basics – what do we see once surrounded by the paintings of artist Igor Grishchenko? The coloristical uniqueness of each painting, the lack of color repeats, is the first thing that is essential to notice. Each painting is characterized by a well-developed, almost musically sounding, color scheme. In most cases, a single color chord fills the entire plane of the visual space. Dissonances, strong color accents are almost nonexistent. Holistic, harmonious melody of color is the foundation of the artist’s scenic design. The decorativeness of a painting style should not be misleading, before us is a realism more authentic than many of the “photo-realistic” imitations of nature. Realism is not about external similarity, but rather about the meaning of the presented plot. • The impression prevailing over narration, is the hallmark of landscape compositions by the artist. 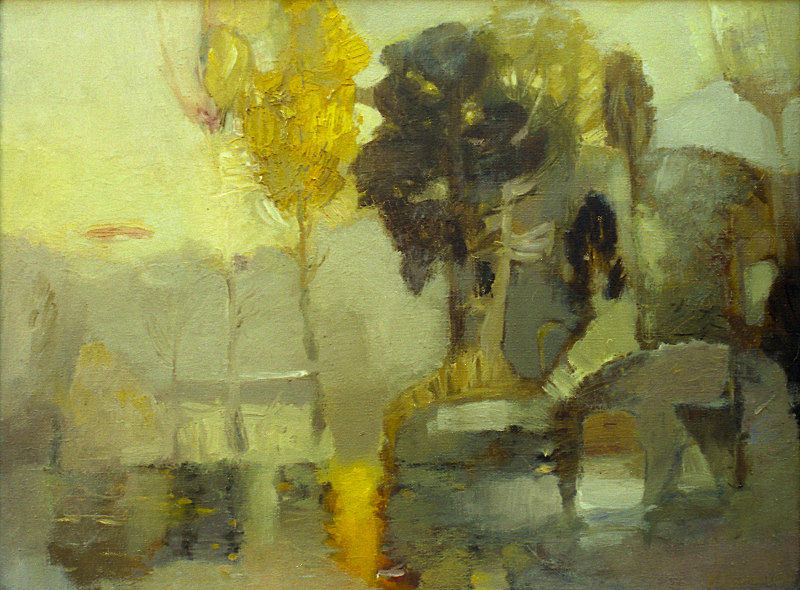 The focus on transferring personal sensory experience can be seen in many paintings. 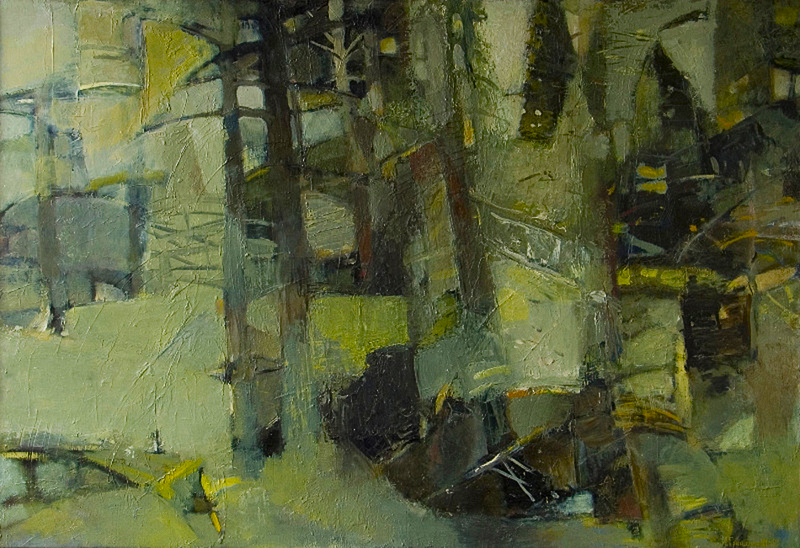 The breath of a real living forest – “Landscape with a spruce”, “October”, “Spruce Forest”. Complex, emotionally rich compositions “Autumn,” “Northern Blues,” “Night Forest”. 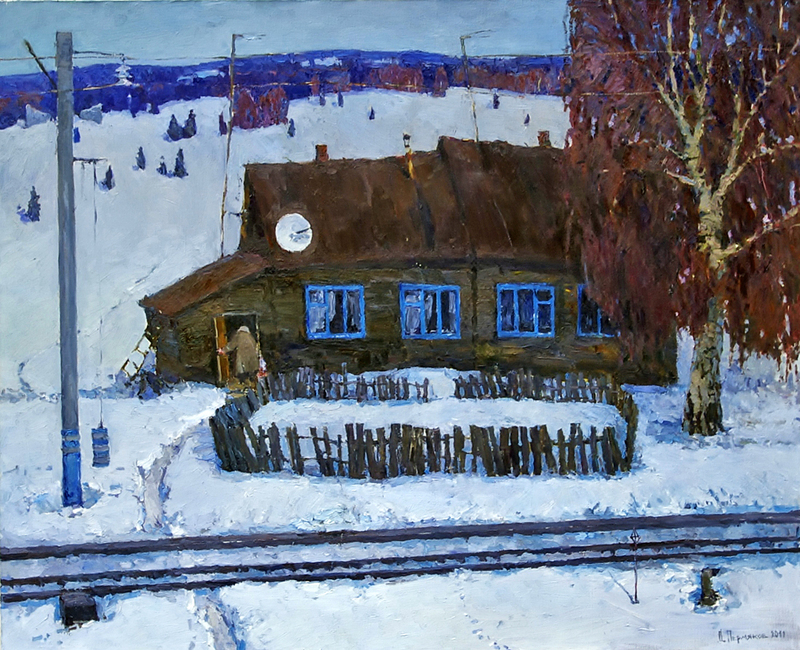 Intense drama in the paintings, “Blooming belogolovnik” and “Autumn Road”. The selectivity of the artist’s perception is confirmed by the well-structured, sometimes rigid, composition of each plot. The authenticity of these feelings and the prudence of artistic means to transmit these feelings, are probably the main features of painting by Igor Grishchenko. These main features involuntarily direct the viewer to the central question – what exactly transforms a canvas filled with paint into a painting? What components need to come together on the canvas to cause a work of fine art? The beginning of an answer to this question lies beyond the image’s plane, in the personality of the artist. Who is he, this mysterious man, who chose for himself a strange craft – of mixing colors? What is the essence of the craft – the ability to draw or the ability to see? The complexity of the assessments and the perceptions of contemporary art are in many ways linked to the orientation of the audience and the critics towards the generally accepted canons and artistic trends. The grading scale is thus attached to the present from the past. Roughly speaking, the definition of “what should be,” is willingly or unwillingly built on the assumption of “what was”. It would be interesting to ask art critics about how they see the future of fine art? And is it possible to also get an assessment of modern art based on the criteria of the future, not the past? The very question seems rhetorical at first glance – the example of empty cells in the periodic table is probably known to everyone. What is getting in the way? Perhaps there is a well-established view of art in society as one of the varieties of the service sector, which implies adherence to the aesthetics of today. This is not true. Fine art does not engage in the servicing of aesthetic needs. Its purpose and scope are in a completely different field. As an illustration, let’s take a look at the work of one of the modern masters. • In the upside down world of the painter Mikhail Kaban-Petrov, everything is very similar to the truth. The inverted boat that will not float because of winter (“Boat”). And will the thawing ever come, and with it the pure water on which you can float, no one knows. Perhaps the thawing will never occur and the boat will not float ever. Is that not true? A door, remarkable in that it is closed (“Door”). Light makes its way under the door – there is someone, there are people, there is life, there people are “… again, not sleeping. Maybe drinking wine, maybe sitting around. 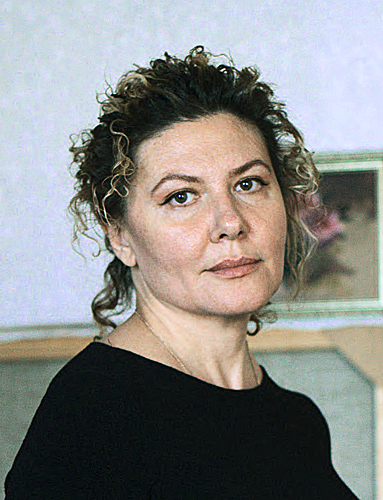 “(M.Tsvetayeva). But we, the audience, and the artist himself, are on this side of the door. Will we be able to get to where the light is? Maybe yes, maybe no. “Heat,” where there are two people noticeably present, although neither are in the plane of the image; and from the outside world there only remains a red-hot streak of light making its way out of a curtained window. There is no life, only the emptiness of heat. The life in here, in this room, and what we see, is but a fragment. A fragment reinterpreted in the artistic space of a canvas. What kind of artwork is this? What is its essence? First of all in this remarkable truth, is a feature invaluable to art – uniqueness, as the Parthenon is unique, despite the abundance of marble. • The artwork of M. Kaban-Petrov is far from symbolism, it contains no set of metaphors. The nature of this painting is deeply national – there is more Dionisy in these canvases than Cezanne. 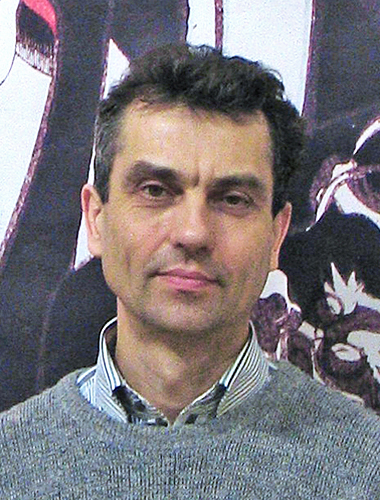 The style of paintings by M. Kaban-Petrov is associated with black and white “graphics” of the novels by Dostoevsky. 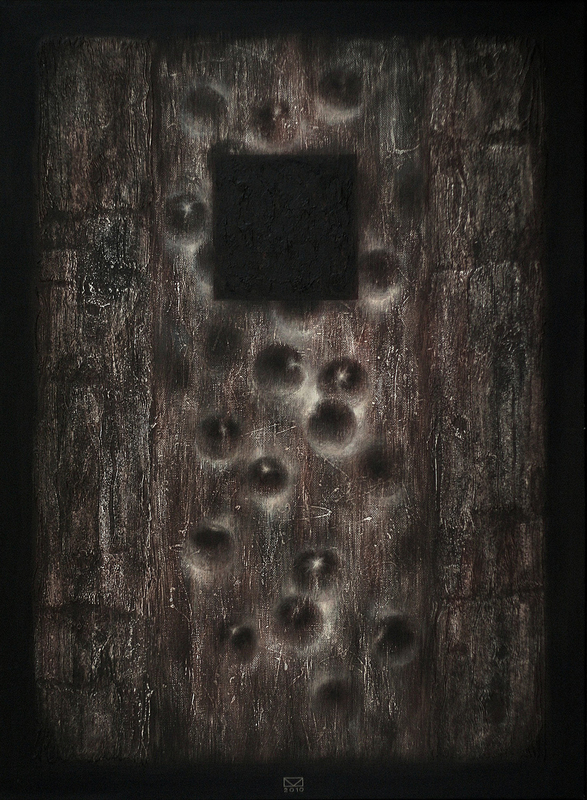 “Requiem”, is made in a “negativity” form that is very unexpected for an artistic painting. “Prayer”, with a tragic red color and the no less tragic “The Wall”, show an inner spiritual relationship with the major themes of Dostoevsky. A thirty years old artist on the current practice is considered young. This is natural, the period of training in fine arts is long and not limited to the years of formal education. Confident independent creative work, in most cases, only begins after thirty. In other words, the thirty-year-olds are the newest generation in art. The interest of the public to this generation is obvious, a new generation means a new look at the world, with their new understanding and new emotions. The creative work of artist Dmitry Permyakov, one of the representatives of this generation, bears many of the basic characteristic features of Russian painting. This is a traditionally high level of color culture, mastery of art composition, and an understanding of its role in creating an artistic image, this is also the attention to the everyday life surrounding the artist. But there are others who also have all this, entering the world of professional fine art as young and certainly talented artists. What distinguishes this particular artist? Let’s take a closer look. 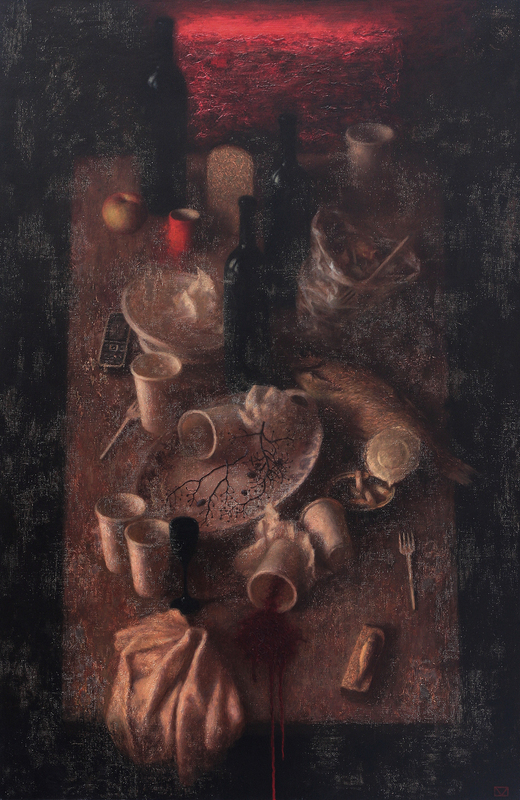 • The subtle coloristical intonations of the artistic constructions by Dmitry Permyakov attract attention at the very first acquaintance with his canvases. The artist avoids rough color-dominants. A precise coloristic tune is built without the help of accents, with maximum use of the effect of color harmony. 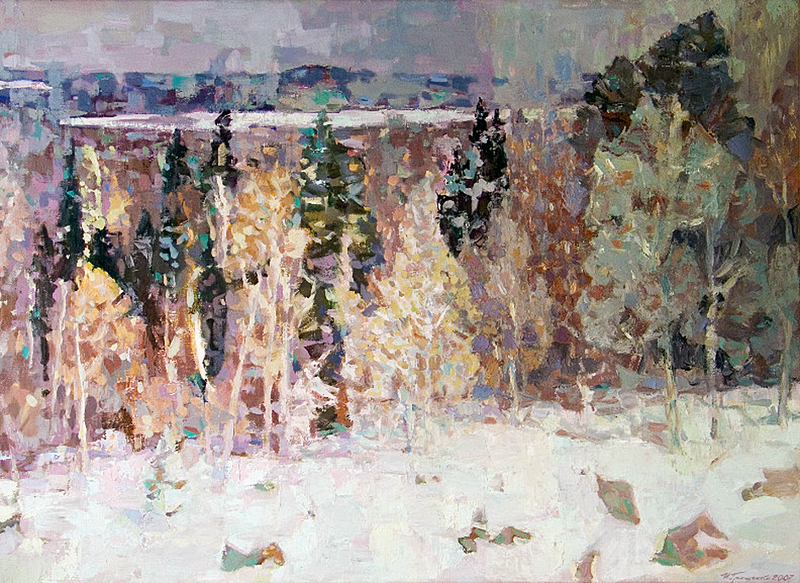 Modest in size, “Ural sketch” demonstrates the unusual intonation quality of paintings by D. Permyakov. A soft, planar sketch, what could be so special about it? Particularly the tone, is what creates an emotionally expressive artistic image. 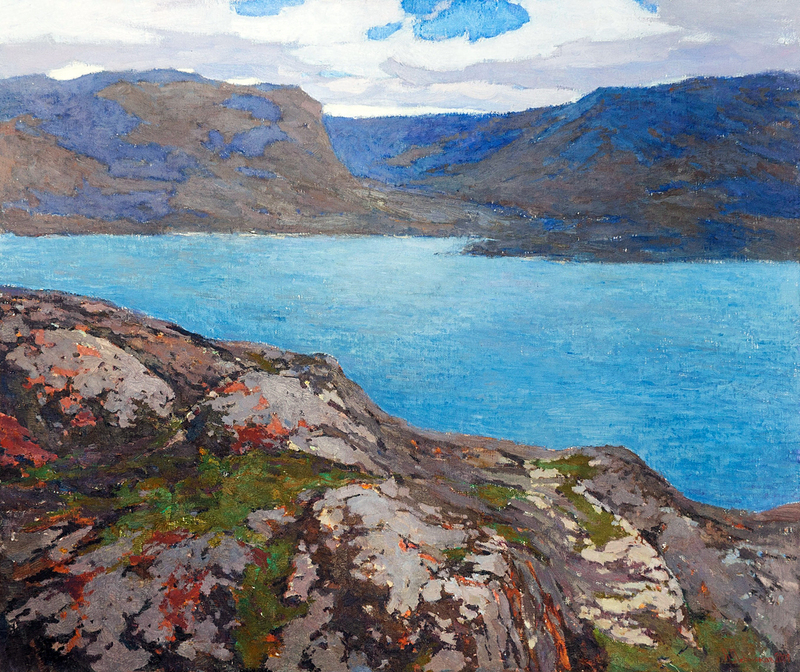 The seen, heartfelt intonation is carefully preserved even in large, studio-landscape compositions (“Barents Sea”, “Montenegrin Ples”). The flawless tonal range, without which it is impossible to work in the model of “landscape-state”, creates the basic, tangible medium of the artistic space of the image’s plane. Restraint, at times austerity in working with color, is evidence of not only talent, but also of the real artistic maturity of the author. Tatiana, congratulations for your magnificent Impressionism work. The colors are like those who use Latinos, bright that give strength and more reality to the work, I’m from Colombia South America, on the other side of the world, but thanks to Linked in together as a large group of artists around the world that we are still struggling because culture does not disappear from the mind of the present generation and less of the future art is the expression of the spirit, mind and body, and for this reason it should exist indefinitely. I wish many successes in your display. MIKHAIL KABAN-PETROV, (KOSTEREVO) – I really love your boat. It spoke to my heart! Keep up the amazing works guys, I’ve incorporated you guys to my blogroll.